A brunch staple, pancakes provide energy to help get you through the morning. Basic pancakes contain a moderate amount of calories and carbohydrates and, when you make pancakes from a mix, you typically add egg and oil, which contribute a small amount of fat and protein calories as well. Of course, the nutritional value of pancakes drastically changes when you add butter and syrup, which increase the saturated fat and sugar content. 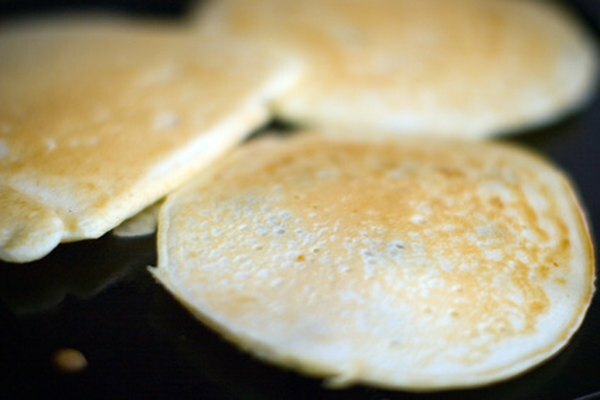 One plain pancake, 6 inches in diameter, contains 149 calories, most of which come from carbohydrates. The calories in one pancake come from 76 percent carbohydrates, 11 percent protein and 13 percent fat. When consumed with 2 tablespoons of syrup and 1 tablespoon of butter, one pancake contains 355 calories, which come from 61 percent carbohydrates, 5 percent protein and 34 percent fat. One plain pancake contains 28.26 grams of carbohydrates, most of which are starch. One pancake contains only 1 grams of fiber, which is less than 5 percent of the recommended daily amount for most adults. To increase your fiber intake, choose whole-wheat pancakes instead. One whole-wheat pancake contains 3.6 grams of fiber, which is 13 percent of the recommended amount. You'll still boost your carb intake -- which provides your tissues with essential fuel -- but the fiber will help regulate your blood sugar levels, as well as support healthy digestion. One plain pancake contains 4 grams of protein, which provides 9 percent of the recommended daily amount for women. To create a breakfast with more protein, eat one egg with your pancake. This will increase the protein content to 10 grams, which is 22 percent of the recommended amount for women and 18 percent for men. Getting enough protein in your diet supports your health, because dietary protein provides amino acids your body needs to repair and maintain all the tissues in your body. One pancake contains 1.9 grams of fat, most of which is health unsaturated fat. Adding one tablespoon of butter to your pancakes adds 11.5 g of fat, more than 7 grams of which is harmful saturated fat. Because it can contribute to high cholesterol and cardiovascular disease, saturated fat should make up less than 10 percent of your daily calories. For most adults, this would mean capping your saturated fat into to 22 grams daily. Pancakes contain large amounts of the minerals phosphorus and selenium. One pancake provides 37 percent of the recommended daily amount of phosphorus, which is important for healthy bones and teeth. One pancake also supplies 19 percent of the recommended amount of selenium, which is an antioxidant that helps protect your body from everyday stress and environmental pollutants. One plain pancake contains more than 10 percent of the recommended amount for two of the water-soluble B vitamins: riboflavin and thiamin. B vitamins are important for a healthy nervous system and the production of red blood cells. One pancake also provides 5 percent of the recommended amount of many other B vitamins, including B-12 and niacin.